In humans, high concentrations of CO2, as found in carbonated beverages, evoke a mixture of sensations that include a stinging or pungent quality. The stinging sensation is thought to originate with the activation of nociceptors, which innervate the respiratory, nasal, and oral epithelia. The molecular basis for this sensation is unknown. Here we show that CO2 specifically activates a subpopulation of trigeminal neurons that express TRPA1, a mustard oil- and cinnamaldehyde-sensitive channel, and that these responses are dependent on a functional TRPA1 gene. TRPA1 is sufficient to mediate responses to CO2 as TRPA1 channels expressed in HEK-293 cells, but not TRPV1 channels, were activated by bath-applied CO2. CO2 can diffuse into cells and produce intracellular acidification, which could gate TRPA1 channels. Consistent with this mechanism, TRPA1 channels in excised patches were activated in a dose-dependent manner by intracellular protons. 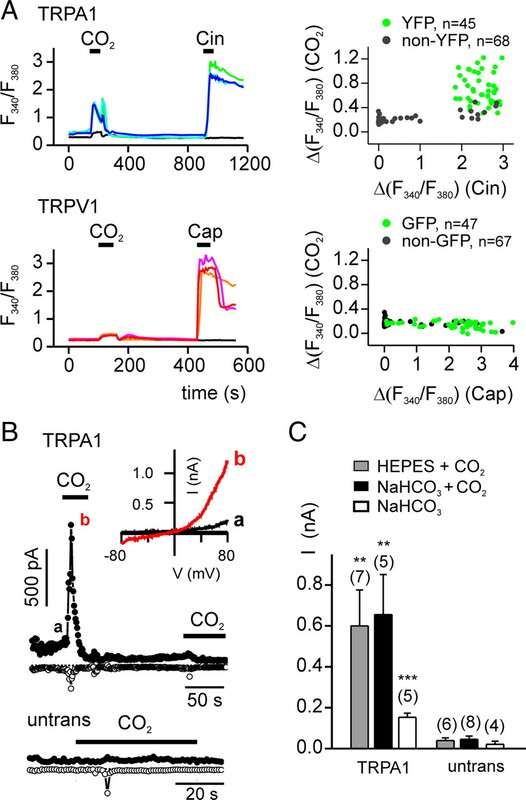 We conclude that TRPA1, by sensing intracellular acidification, constitutes an important component of the nociceptive response to CO2. Humans can sense gaseous CO2, which produces a pungent sensation, as noted more than 100 years ago by the Scottish philosopher Alexander Bain (Cain and Murphy, 1980). Mediating the responses to CO2 in different organisms are a variety of sensory structures and sensory receptors (Luo et al., 2009). For example, in flies, gaseous CO2 is detected by gustatory receptors on the antenna, whereas dissolved CO2 is detected on the proboscis, and CO2 is either aversive or attractive depending on the sensory structure activated (Suh et al., 2004; Fischler et al., 2007; Jones et al., 2007; Kwon et al., 2007). In mice, ingested CO2 is sensed by taste receptors in the mouth (Chandrashekar et al., 2009), and blood CO2 is detected in the brainstem by K+ channels (Trapp et al., 2008) and in the amygdala by acid-sensing ion channel (ASIC) 1a (Ziemann et al., 2009), whereas atmospheric levels of CO2 are detected by guanylyl cyclase D (GC-D), which is expressed in a subset of olfactory sensory neurons (Luo et al., 2009). This latter system is missing in humans and most other primates for whom GC-D is a pseudogene (Young et al., 2007). Although it is widely believed that the noxious sensation of CO2 is due to activation of trigeminal nerve fibers that innervate the nasal and oral cavity (Silver and Moulton, 1982; Steen et al., 1992), the mechanisms by which trigeminal nociceptors detect CO2 remain obscure. Candidates to mediate responses to CO2 include the capsaicin receptor, TRPV1, which is expressed in trigeminal and dorsal root ganglia and activated by extracellular protons (Caterina et al., 1997; Tominaga et al., 1998), and the ASICs, which are widely distributed (Waldmann and Lazdunski, 1998); however, the response of sensory nerve fibers to CO2 is distinct from the response to extracellular protons, suggesting the participation of other receptors (Steen et al., 1992; Simons et al., 1999). Another candidate is the “wasabi receptor” TRPA1, which forms a cation channel expressed by a subset of TRPV1-containing neurons (Bautista et al., 2006; Bandell et al., 2007). Agents that activate TRPA1 include plant products such as mustard oil and cinnamaldehyde (Cin), industrial products such as formaldehyde and acrolein, and products of oxidative stress (Patapoutian et al., 2009). The observation that CO2 evokes a sensation that is described as painful suggests TRPA1 may also mediate responses to this gas. All experimental procedures were approved by the Institutional Animal Care and Use Committee of the University of Southern California. Mice were derived from crosses of TRPA1−/− (B6;129P-Trpa1tm1Kykw /J) and wild-type (B6129PF2/J) mice (The Jackson Laboratory) and were genotyped by PCR. Cultures of trigeminal ganglion neurons. Trigeminal ganglion neurons were dissociated from postnatal 2∼6-week-old mice as previously described (Takashima et al., 2007). In brief, the isolated trigeminal ganglia from two mice were dissected and sequentially incubated in 0.25% collagenase type I for ∼30 min at 37°C and in 0.05% trypsin for 1 min at 37°C. The isolated cells were plated onto six to 12 glass coverslips coated with Matrigel and incubated at 37°C for 24–48 h in culture media supplemented with 100 ng/ml NGF. Data shown represent the results from three to six cultures from 6 to 12 mice. cDNAs and expression in HEK-293 cells. A yellow fluorescent protein (YFP) fusion of rat TRPA1 (Wang et al., 2008) was transiently transfected into HEK-293 cells using TransIT-LT1 transfection reagent (Mirus Bio). For excised-patch recording, we used native rat TRPA1 cotransfected with green fluorescent protein (GFP; 20:1). Recordings or Ca2+ imaging experiments were performed ∼24–48 h after transfection at room temperature. Measurement of agonist-induced changes in intracellular Ca2+ was as previously described (Zhang et al., 2007). In brief, cells were loaded with fura-2 AM and Ca2+ levels were measured from the ratio of emission in response to excitation at 340 and 380 nm. All cells showed nonspecific responses to CO2 [average of 0.15 arbitrary unit (AU)] (supplemental Fig. 1, available at www.jneurosci.org as supplemental material), which may be attributed to effects of intracellular acidification on emission by the dye or on Ca2+ handling (Martínez-Zaguilán et al., 1996). Responses were, therefore, categorized as positive if the change in F (340)/F (380) after application of agonist was > 0.33 AU, 4 SDs higher than the average nonspecific response. The same threshold was applied to all agonists and all conditions. Venn diagrams were drawn using Venn Diagram Plotter (PNNL; http://omics.pnl.gov). Patch-clamp electrophysiology was performed as previously described (Liu and Liman, 2003; Zhang et al., 2007). For whole-cell recordings, the membrane potential was held at −80 mV and ramped from −80 mV to 80 mV (1 V/s). Extracellular solution was exchanged either by gravity flow through the chamber (for experiments in which responses to CO2 were measured) or by placing the cell or patch in front of a linear array of microperfusion pipes that were moved under computer control (for block by extracellular protons and excised patch experiments; Warner Instruments). For most experiments, responses were quantified as the change in the magnitude of the current compared with current immediately before agonist delivery. Excised-patch recording was as described previously (Liu and Liman, 2003): following formation of a gigaohm seal, the patch was excised into Ca2+-free solution and positioned in front of the microperfusion pipes. For Ca2+ imaging experiments, the bath solution contained the following (in mm): 145 NaCl, 10 HEPES, 5 KCl, 20 glucose, 1 MgCl2, 2 CaCl2, pH 7.4 or pH 6.75 as indicated. CO2 (100%) was bubbled into the following (in mm): 100 NaHCO3, 50 NaCl, 1.25 NaH2PO4, 2.5 KCl, 25 glucose, 1 MgCl2, 2 CaCl2, pH 6.75 with CO2. High K+ solution contained the following (in mm): 150 KCl, 2 CaCl2, 10 HEPES, pH 7.4. For whole-cell patch-clamp recordings, the bath solution was as follows (in mm): 150 NaCl, 2 CaCl2, 10 HEPES, pH 7.4. CO2 was bubbled into this solution (pH 5.3–5.4 with CO2) as indicated. Bicarbonate buffered saline contained the following (in mm): 25 NaHCO3, 125 NaCl, 25 glucose, 2.5 KCl, 1.25 NaH2PO4, 2 CaCl2, 1 MgCl2, pH 7.4; pH 5.9 with CO2. Internal solution contained the following (in mm): 145 CsCl, 5 EGTA, 10 HEPES, with 3 CaCl2 (100 nm free Ca2+) and 2 MgATP, pH 7.4 with CsOH. To exclude the possibility that the observed effects were due to release of Ca2+ from the chelator in response to intracellular acidification, in some experiments Ca2+ and MgATP were excluded from the internal solution (as indicated). Ca2+ free-bath solution contained the following (in mm): 150 NaCl, 0.5 EGTA, with 10 HEPES, pH 7.4. Acidic solutions contained 150 mm NaCl, 0.5 mm EGTA, and 10 mm MES, pH 3–6. For excised-patch experiments, the pipette solution was 150 mm NaCl, 0.5 mm EGTA, with 10 mm HEPES, pH 7.4. Solution applied to the cytoplasmic side of the cell contained 150 mm KCl, 0.5 mm EGTA, 1 mm pentasodium tripolyphosphate hexahydrate (polyP3) buffered with either 10 mm HEPES, pH 7.4, 9.5, or 5.5 (supplemental Fig. 3, available at www.jneurosci.org as supplemental material) or 10 mm MES, pH 6.5–4.5. Cinnamaldehyde, capsaicin, and polyP3 were purchased from Sigma. Fura-2, collagenase type I, DMEM, F-12, trypsin, and gentamicin were from Invitrogen. N-(4-Tertiarybutylphenyl)-4-(3-chloropyridin-2-yl)tetrahydropyrazine-1(2H)-carboxamide (BCTC) was from Biomol. Matrigel was from BD Biosciences. When comparing numbers of responsive cells, Pearson's χ2 test was used; otherwise Student's t test was used. To identify mechanisms by which nociceptors respond to CO2, we measured agonist responses in cultured trigeminal sensory neurons using ratiometric Ca2+ imaging. A subset of neurons (30 of 292) responded strongly to extracellular solution bubbled with CO2 but not to a control solution at the same pH (pH 6.75) (Fig. 1 A,B); these cells were classified as CO2-sensitive. Because all cells showed nonspecific responses to CO2 (Martínez-Zaguilán et al., 1996), for this analysis, responses were only counted as positive if the change in the emission ratio exceeded 0.33 AU, a value chosen as 4 SDs higher than the average nonspecific response (see Materials and Methods) (supplemental Fig. 1, available at www.jneurosci.org as supplemental material). The same criterion was applied to all cells and all agonists. Nearly all CO2-sensitive cells responded to a later application of the TRPA1 agonist Cin (100 μm; 25 of 30 cells) and to the TRPV1 agonist capsaicin (Cap; 1 μm; 29 of 30 cells) (Fig. 1 B). Overall, CO2-responsive cells were highly enriched in the population of Cin-responsive cells compared with the population of all electrically responsive cells (25 of 65 compared with 30 of 292; χ2, p < 0.0001) and the magnitudes of the responses of individual cells to CO2 were correlated with the magnitudes of the responses of the same cells to Cin (r = 0.625, p < 0.001) (Fig. 1 C). CO2-responsive cells were also enriched in the population of Cap-responsive cells (29 of 140 compared with 30 of 292; χ2, p < 0.01) (Fig. 1 B). However, because TRPA1 is expressed in a subset of TRPV1-containing cells, and CO2 responses were largely confined to those cells that also responded to the TRPA1 agonist, CO2 responses were more closely associated with responses to the TRPA1 agonist than with responses to the TRPV1 agonist (χ2, p < 0.01). 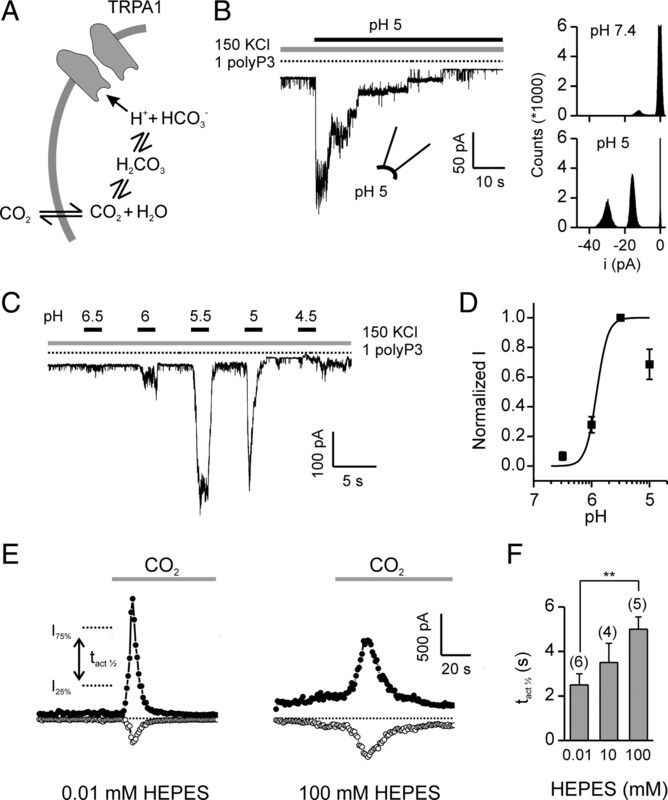 Responses of trigeminal sensory neurons to carbon dioxide. A , Agonist responses of cultured trigeminal sensory neurons from wild-type mice measured with ratiometric calcium imaging. Scale is from 0 to 2.3 AU. B , D , Time course of the agonist responses of representative trigeminal neurons isolated from wild-type or TRPA1−/− animals. A subpopulation of trigeminal neurons from wild-type mice responded to CO2 and to the TRPA1 agonist Cin (100 μm) and the TRPV1 agonist Cap (1 μm) ( B , green and blue traces). 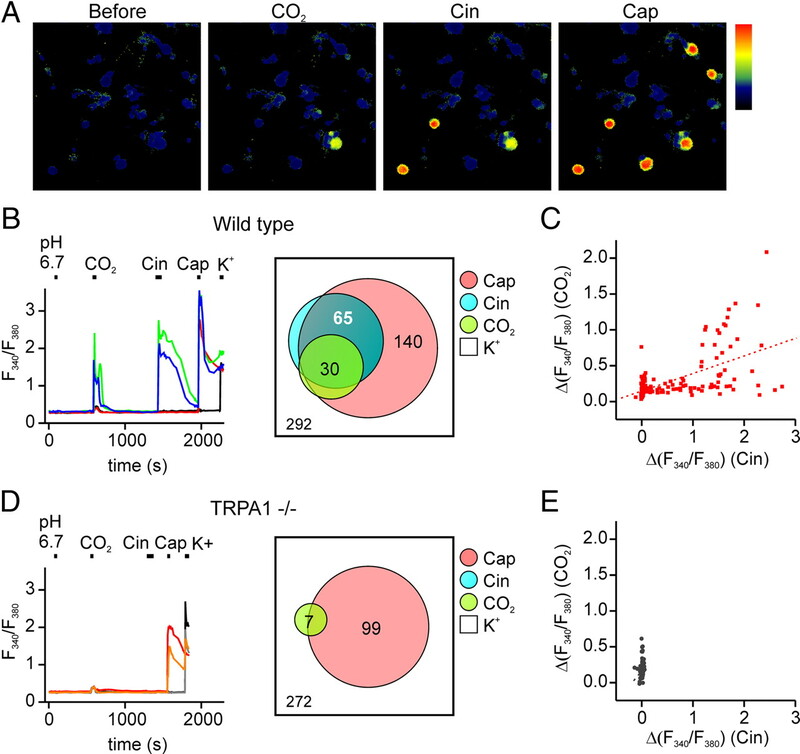 In contrast, in cultures from TRPA1−/− mice, few cells responded to CO2 and none responded to Cin, whereas responses to Cap were maintained ( D , orange and red traces). Venn diagrams show the aggregate results from all experiments. Numbers represent the total count of the responsive cells to each agonist, and overlap and size of each circle is drawn to scale. C , E , Scatter plot of the magnitude of the response to CO2 as a function of the response to Cin from the experiment as in B and D , respectively. r = 0.625 for fit to data in C .
To determine whether the responses of trigeminal neurons to CO2 were mediated by TRPV1, we repeated the experiment in the presence of 1 μm of the TRPV1 blocker BCTC (supplemental Fig. 2, available at www.jneurosci.org as supplemental material) (Valenzano et al., 2003). Under these conditions, the proportion of cells responding to CO2 was unchanged (38 of 388 vs 30/292, χ2, p > 0.83), whereas, as expected, responses to capsaicin were completely abolished (0 of 388). Thus, TRPV1 is unlikely to contribute to the CO2 response. To test whether responses to CO2 were mediated instead by TRPA1, we repeated the experiment with trigeminal neurons isolated from TRPA1 knock-out animals (Fig. 1 D,E) (Kwan et al., 2006). Responses to CO2 were largely absent from these cultures, indicating that a functional TRPA1 gene is required for CO2 sensitivity of trigeminal sensory neurons (7 of 272 cells compared with 30/292; χ2, p < 0.001). It should be noted that the residual CO2 responses in these cultures were on average smaller than responses in Cin-sensitive cells from wild-type cultures (0.46 ± 0.03 vs 0.80 ± 0.073 AU; p < 0.05, one-tailed Mann–Whitney U test); they may represent either nonspecific responses that escaped our threshold or a TRPA1-independent CO2-sensing mechanism. We next asked whether TRPA1 could be activated by CO2. HEK-293 cells transfected with TRPA1 generated robust responses to CO2 as measure by Ca2+ imaging (43 of 45 YFP-positive cells) (Fig. 2 A); similar responses were not observed in either untransfected or TRPV1-transfected cells (0 of 183 and 0 of 47 GFP-positive cells responded, respectively; χ2 p < 0.0001 for both compared with the response of TRPA1 transfected cells) (Fig. 2 A). Interestingly, the response of TRPA1-transfected cells to CO2 showed the same biphasic time course as did the response of native cells (compare Figs. 2 A, 1 B). In whole-cell patch-clamp recording, bath-applied CO2 bubbled into HEPES or bicarbonate-buffered saline elicited large currents in TRPA1-transfected, but not in untransfected, HEK-293 cells (Fig. 2 B,C). The CO2-activated current in TRPA1-expressing cells reversed at −5.74 ± 1.30 mV (n = 7), as expected for a nonselective cation channel, and showed strong outward rectification (−I80/I−80 = 9.47 ± 2.18, n = 7). Following activation in response to CO2, TRPA1 currents rapidly inactivated. Additional responses could not be evoked by CO2 during the time period of the recording (n = 4) (Fig. 2 B). Currents of similar magnitude and inactivation kinetics were activated regardless of whether the intracellular solution contained a physiological concentration of Ca2+ or was Ca2+-free (I = 1.2 ± 0.1 nA, n = 6 vs 2.3 ± 0.5 nA, n = 7, respectively; p = 0.1; inactivation t 1/2 = 2.8 ± 0.4 s, n = 6 vs t 1/2 = 3.8 ± 0.8 s, n = 6, respectively; p = 0.3), indicating that activation of TRPA1 by CO2 was not mediated by elevation of intracellular Ca2+ (Wang et al., 2008). The observations that currents of similar magnitudes were activated when CO2 was bubbled into HEPES and bicarbonate-buffered solutions (Fig. 2 C), and currents of a smaller magnitude were evoked in response to the bicarbonate solution alone (Fig. 2 C), indicate that the responses could not be attributed to a direct effect of the extracellular bicarbonate ion. The small response evoked by the bicarbonate solution alone can be attributed to the low concentration of CO2 at equilibrium in this solution (∼2 mm compared with ∼33 mm in the CO2-saturated solutions). Carbon dioxide activates TRPA1. A , Agonist-induced elevation of intracellular Ca2+ in HEK-293 cells transfected with TRPA1 or TRPV1, as indicated. TRPA1-expressing cells responded to both CO2 and Cin (100 μm), whereas TRPV1-expressing cells responded only to Cap (1 μm). Right, Scatter plot of the magnitude of the response to CO2 as a function of the response to Cin (top) or Cap (bottom). B , Whole-cell currents evoked in response to CO2 bubbled in HEPES-buffered saline from HEK-293 cells expressing TRPA1. The small inward current in the untransfected cells represents the endogenous ASIC current. Inset, I–V relationship at the times indicated. C , Average data from experiments as in B showing the peak outward current (at 80 mV) evoked in TRPA1-expressing or untransfected (untrans) cells to CO2 in HEPES-buffered saline (HEPES + CO2), CO2 in bicarbonate-buffered saline (NaHCO3 + CO2),or bicarbonate-buffered saline alone (NaHCO3). Data are represented by the mean ± SEM. **p < 0.01, ***p < 0.001 (comparison with untransfected by one-tailed Student's t test). To determine whether responses of TRPA1 to CO2 could be attributed to gating of the channel by extracellular protons, we tested whether extracellular acidification alone could activate TRPA1 currents. Extracellular solution of pH 5.3 elicited no response in TRPA1-transfected cells, although these cells responded to a subsequent application of CO2 (in HEPES-buffered saline, pH 5.3) (Fig. 3 A,B). Interestingly, more severe extracellular acidification had a blocking effect on Cin-activated TRPA1 currents (Fig. 3 C,D). TRPA1 channels are blocked by extracellular protons. A , Whole-cell currents in HEK-293 cells expressing TRPA1 were activated by CO2 in HEPES-buffered saline, pH 5.3, but not by extracellular acidification alone, pH 5.3. The small inward current in response to the pH 5.3 solution represents the endogenous ASIC current. Both the internal and external solution were Ca2+-free. B , Average peak outward current (at 80 mV) from experiments as in A . Data are represented by the mean ± SEM. **p < 0.01 (two-tailed Student's t test). C , TRPA1 currents activated by Cin (100 μm) were blocked in a dose-dependent manner by extracellular acidification. Ca2+ was omitted from the extracellular solution to prevent inactivation. D , Dose dependence of proton block of TRPA1 currents from experiments as shown in A (n = 7). For currents at V m = 80 mV, the data were fit was with a Hill equation with V max = 1, K1/2 = 140 μm, n = 0.62. For currents at V m = −80 mV, the data were fit with V max = 1, K1/2 = 8.04 μm, n = 0.91. How does CO2 activate TRPA1? CO2 can freely diffuse into cells where it re-equilibrates to generate bicarbonate (HCO3 − ) and a free proton (H+), causing acidification of the cell cytosol that can reach as low as pH 6 for 100% CO2 at atmospheric pressure (Fig. 4 A) (Caldwell, 1958). To determine whether elevation of intracellular protons is sufficient to activate TRPA1, we measured responses in excised patches to changes in cytoplasmic pH. In patches from HEK-293 cells transfected with TRPA1, a cytoplasmic solution adjusted to pH 5 strongly activated TRPA1 channels, which had a unitary current of −14.1 ± 0.3 pA at −80 mV (n = 9; 9 of 16 patches responded) (Fig. 4 B). No channels were activated in patches from untransfected cells (n = 3). Channel activity showed inactivation in the continued presence of the acidic solution, similar to the inactivation observed in whole-cell recording (Fig. 4 B). Responses of TRPA1 channels to intracellular protons were dose-dependent (Fig. 4 C,D). Activation could be observed beginning at pH 6.5 and reached a maximum at approximately pH 5.5. As compared with the response to acidic solutions, alkaline solutions, pH 9.5, produced no detectable activation (supplemental Fig. 3, available at www.jneurosci.org as supplemental material) (Fujita et al., 2008; Dhaka et al., 2009). Carbon dioxide activates TRPA1 through intracellular acidification. A , Model for activation of TRPA1 by CO2. B , Channel activity in an inside-out patch from a HEK-293 cell transfected with TRPA1 in response to cytoplasmic solution of pH 5 (1 mm polyP3 to retain channel activity; V m= −80 mV) (Kim and Cavanaugh, 2007). All points histogram shows the amplitude of the response. C , Current activation (V m = −80 mV) in response to increasing concentrations of protons (buffered by 10 mm MES, in the presence of 1 mm polyP3) in an inside-out patch. D , Dose-response curve for activation of TRPA1 currents by intracellular protons from experiments as in C . Data were normalized to the current at pH 5.5 in each patch. Fit was with V max = 1, K1/2 = 1.23 μm, n = 4.55. Data are represented by the mean ± SEM, n = 12. E , Responses to CO2 (bubbled into HEPES-buffered saline) from TRPA1-expressing HEK-293 cells in whole-cell recording with a pipette solution containing 10 μm HEPES (left) or 100 mm HEPES (right). F , Average data from experiments as in E , showing the half-activation time (time from 25% to 75% of the peak outward current; right). Data are represented by the mean ± SEM. **p < 0.01 (two-tailed Student's t test). 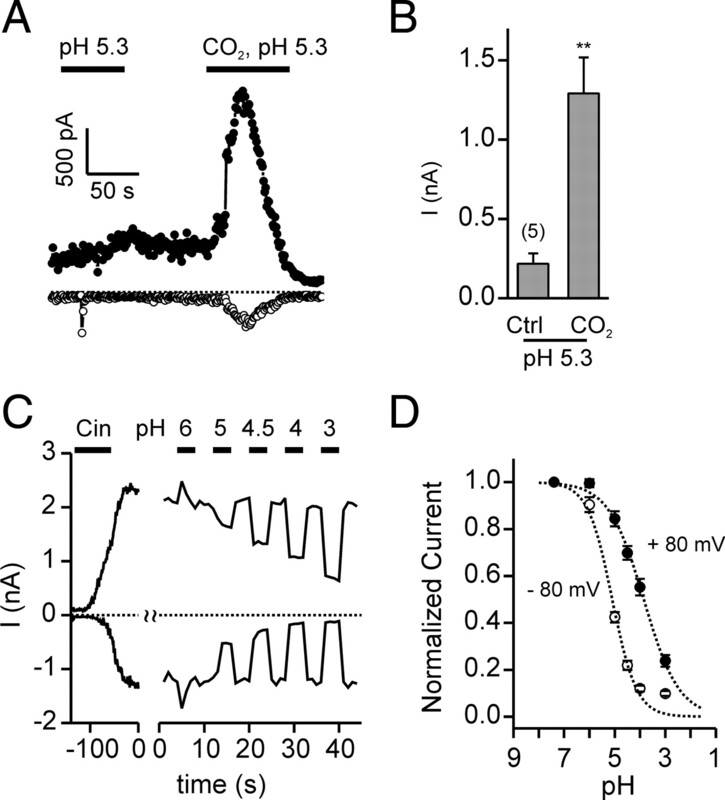 If a change in the concentration of intracellular protons contributes to the activation of TRPA1 by CO2, then strongly buffering intracellular pH should affect the response. Indeed, activation of TRPA1 by CO2 was significantly slowed under conditions in which the intracellular pH was strongly buffered (100 mm HEPES) compared with when it was weakly buffered (0.01 mm HEPES) (Fig. 4 E,F). These data indicate that intracellular protons gate TRPA1, either by binding directly to the channel, or by interacting with closely associated molecules (Fig. 4 A). Our results show that the ion channel TRPA1 is both necessary and sufficient to mediate responses of trigeminal sensory neurons to CO2 and that activation of TRPA1 is downstream of intracellular acidification. Although ion channels such as ASIC and TRPV1, which respond to extracellular acidification and are expressed by nociceptors, have been well described (Waldmann and Lazdunski, 1998; Caterina and Julius, 2001), a specific sensor within nociceptors for intracellular acidification has not been reported. Moreover, our data argue against a specific contribution of the capsaicin receptor TRPV1 to the trigeminal response to CO2, as we observed neither a significant decrease in the response of sensory neurons to CO2 following block of TRPV1 nor an activation of heterologously expressed TRPV1 by application of CO2. It is nonetheless possible, that under natural conditions, the extracellular acidification that accompanies CO2 exposure could recruit cells that express only TRPV1. Our report is one of the first descriptions of a nonspecific cation channel that is gated by intracellular protons. A previous study showed that protons delivered in the extracellular solution could activate TRPA1 (Takahashi et al., 2008). However, in this study, which was done solely with Ca2+ imaging, it was not determined whether protons act on an extracellular site on TRPA1 or enter the cell and act on an intracellular site. Our data with excised patches show that intracellular protons, at a concentration as low as 1 μm, can directly activate TRPA1 channels. Interestingly, it was recently found that the fly phototransduction channel, dTRP, which is distantly related to TRPA1, is gated by cytosolic acidification, and this may be the mechanism for activation of this channel by the phototransduction cascade (Huang et al., 2010). Several two-pore domain K+ channels are activated by intracellular acidosis, including TREK2, which is expressed by DRG neurons (Patel and Honoré, 2001; Kang and Kim, 2006). However, these channels inhibit electrical activity under conditions of cellular acidosis, and thus are unlikely to contribute to the excitatory sensory response to CO2. Our data show that acidification has two opposing effects on TRPA1. From the inside, protons activate TRPA1, and from the outside, they block channel activity. Interestingly, TRPV1 shows the opposite response to protons; it is activated by extracellular acidification and by intracellular alkalinization (Dhaka et al., 2009). Block by extracellular acidification would be expected to dampen TRPA1-mediated pain response under conditions of tissue acidosis; however, the extremely low pH levels required to observe block of TRPA1 (<pH 5) may never be attained in intact tissues (Bevan and Geppetti, 1994). We did not observe significant activation of TRPA1 channels in excised patches in response to solutions of basic pH, pH 9.5, contrary to a previous report suggesting that responses to ammonia, which produces intracellular alkalinization, were mediated by TRPA1 (Fujita et al., 2008). However, a more recent report provides evidence that TRPV1, not TRPA1, is the primary target for ammonia (Dhaka et al., 2009). Together with other recent reports, our data highlight the diversity of sensory systems and cellular mechanisms within vertebrates for the detection of CO2. These include the olfactory system, where a subset of GC-D-expressing cells respond to CO2 (Luo et al., 2009), the taste system, for which CO2 evokes a sour sensation mediated by PKD2L1-expressing taste cells (Chandrashekar et al., 2009), and the trigeminal system, where, according to our data, TRPA1 contributes to the noxious response. In addition, there are at least two central systems that detect elevated levels of CO2 in the bloodstream: the brainstem, which controls ventilatory responses, and the amygdala, which controls fear responses (Trapp et al., 2008; Ziemann et al., 2009). How these systems work together to create the distinct sensations and behaviors elicited by CO2 can now be investigated by genetically manipulating each of these systems alone and in combination. This work was supported by National Institutes of Health Grant DC004564 to E.R.L. We thank H. Waters for technical support, D. Corey for providing mice, D. McKemy and R. Daniels for advice in preparing neuronal cultures, and D. Arnold and D. McKemy for careful reading of the manuscript. (2007) From chills to chilis: mechanisms for thermosensation and chemesthesis via thermoTRPs. Curr Opin Neurobiol 17:490–497. (1994) Protons: small stimulants of capsaicin-sensitive sensory nerves. Trends Neurosci 17:509–512. (1980) Interaction between chemoreceptive modalities of odour and irritation. Nature 284:255–257. (1958) Studies on the internal pH of large muscle and nerve fibres. J Physiol 142:22–62. (2009) The taste of carbonation. Science 326:443–445. (2009) TRPV1 is activated by both acidic and basic pH. J Neurosci 29:153–158. (2007) The detection of carbonation by the Drosophila gustatory system. Nature 448:1054–1057. (2008) Intracellular alkalization causes pain sensation through activation of TRPA1 in mice. J Clin Invest 118:4049–4057. (2010) Activation of TRP channels by protons and phosphoinositide depletion in Drosophila photoreceptors. Curr Biol 20:189–197. (2007) Two chemosensory receptors together mediate carbon dioxide detection in Drosophila Nature 445:86–90. (2006) TREK-2 (K2P10.1) and TRESK (K2P18.1) are major background K+ channels in dorsal root ganglion neurons. Am J Physiol Cell Physiol 291:C138–C146. (2007) Requirement of a soluble intracellular factor for activation of transient receptor potential A1 by pungent chemicals: role of inorganic polyphosphates. J Neurosci 27:6500–6509. (2007) The molecular basis of CO2 reception in Drosophila Proc Natl Acad Sci U S A 104:3574–3578. (2003) Intracellular Ca2+ and the phospholipid PIP2 regulate the taste transduction ion channel TRPM5. Proc Natl Acad Sci U S A 100:15160–15165. (2009) Neural detection of gases–carbon dioxide, oxygen–in vertebrates and invertebrates. Curr Opin Neurobiol 19:354–361. (1996) Simultaneous measurement of intracellular pH and Ca2+ in insulin-secreting cells by spectral imaging microscopy. Am J Physiol 270:C1438–C1446. (2009) Transient receptor potential channels: targeting pain at the source. Nat Rev Drug Discov 8:55–68. (2001) Properties and modulation of mammalian 2P domain K+ channels. Trends Neurosci 24:339–346. (1982) Chemosensitivity of rat nasal trigeminal receptors. Physiol Behav 28:927–931. (1999) Neurobiological and psychophysical mechanisms underlying the oral sensation produced by carbonated water. J Neurosci 19:8134–8144. (1992) Protons selectively induce lasting excitation and sensitization to mechanical stimulation of nociceptors in rat skin, in vitro. J Neurosci 12:86–95. (2004) A single population of olfactory sensory neurons mediates an innate avoidance behaviour in Drosophila Nature 431:854–859. (2008) Molecular characterization of TRPA1 channel activation by cysteine-reactive inflammatory mediators. Channels (Austin) 2:287–298. (2007) Diversity in the neural circuitry of cold sensing revealed by genetic axonal labeling of transient receptor potential melastatin 8 neurons. J Neurosci 27:14147–14157. (2008) A role for TASK-1 (KCNK3) channels in the chemosensory control of breathing. J Neurosci 28:8844–8850. (2003) N-(4-tertiarybutylphenyl)-4-(3-chloropyridin-2-yl)tetrahydropyrazine-1(2H)-carbox-amide (BCTC), a novel, orally effective vanilloid receptor 1 antagonist with analgesic properties. I. In vitro characterization and pharmacokinetic properties. J Pharmacol Exp Ther 306:377–386. (1998) H(+)-gated cation channels: neuronal acid sensors in the NaC/DEG family of ion channels. Curr Opin Neurobiol 8:418–424. (2008) The nociceptor ion channel TRPA1 is potentiated and inactivated by permeating calcium ions. J Biol Chem 283:32691–32703. (2007) Degeneration of the olfactory guanylyl cyclase D gene during primate evolution. PLoS ONE 2:e884. (2007) The transduction channel TRPM5 is gated by intracellular calcium in taste cells. J Neurosci 27:5777–5786. (2009) The amygdala is a chemosensor that detects carbon dioxide and acidosis to elicit fear behavior. Cell 139:1012–1021.